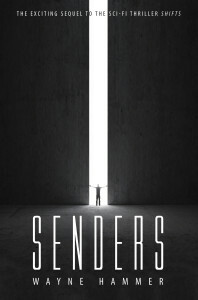 In this sequel to sci-fi thriller, Shifts, carriers of a rare gene destined to alter the course of human evolution align themselves with cult members of the New Order of Canaan and a wealthy industrialist on a damning mission to destabilize the global economy and indoctrinate the world with his warped vision of social justice. It’s been a year since Michael Duchesne’s son Mitch, helped recover el Registro de Dios, a telling record of man’s evolution. The Registro’s message and the rare gift Mitch held secret since childhood places him at the center of an international conspiracy of wealthy industrialist Lucas Shore’s making. As economic forays orchestrated by Shore begin to take effect, unlikely allies emerge from obscurity to expose his manipulation and true motives. Only genetic phenom, Mitch, with the aid of mentor, Dr. Herman Walenz, and a science research team led by Amanda Greene, has the “brain power” to derail the conspiracy and win the battle for Sender supremacy. In a selfless gesture, Mitch forfeits his relationship with family and friends, as he fights to unravel Shore’s unholy alliance with mutant gene carriers and fulfill the Registro’s Seventh Prophecy.